The above info came from Stephanie Terrell, and was edited by yours truly (contact me). The image came from Maxam.fr.st. Hunter x Hunter begins as the simple tale of a boy searching for his father... and quickly spirals off into a series of complex story arcs involving the main character, Gon, and the people he meets during the Hunter Exam. The Hunter Exam is a series of bizarre life or death trials one must conquer in order to enter into the mysterious and prestigious ranks of professional Hunters, among whom his father is legendary. Gon's primary companions are the brazen Leorio who aspires to be a doctor, Kurapica, the red-eyed pacifist with a vengeance to fulfill, and the young assassin Killua. Not to exclude the colorful cast of rivals such as Hisoka, Illumi, Kuroro, and the Spiders. There is an organization out there that leave crime scenes with no trace that they were there. No one has ever seen them or knows who they are. It is for this reason that they are referred to as Genei Ryoden (literally, "Phantom Troupe" or "Phantom Brigade"), since they disappear without a trace, just like a ghost. The real name of the organization is The Spiders. They refer to themselves as The Spider and each member has a spider tattooed onto their body. 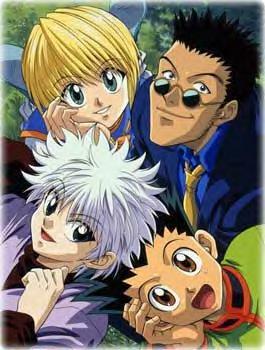 Gon, Killua, Kurapica, and Leorio, and Hisoka also call the group The Spiders because they are the only people to have seen the group and lived. The above description came from Stephanie Terrell and Becky Webb, and was edited by yours truly (contact me).